Leonardo’s project for a giant crossbow is found in a number of sheets in the Codex Atlanticus and Fol 149r shows the most well-defined and complete drawing. The effort put into the design of the components indicates that he was striving to realise it as a workable weapon. The structure is huge; its dimensions can be judged when comparing the machine to the drawing of a man who is operating it. The bow is made up of a number of flexible wooden pieces bound together by cords and held in place by pivoting pins. The bow has a span of about thirteen metres and it is stretched by a complex screw mechanism. Leonardo placed winches, which regulate the traction, at the rear sides of the bow. These also set in motion a second screw mechanism which was designed to reduce the force required to tighten the bow. 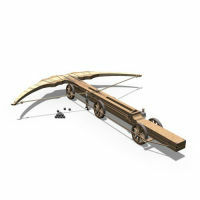 The cross bow is so big that the six wheels are set at a slight angle in order to increase its stability. Instead of arrows, the cross bow would fire heavy balls. The weak point of the whole project is the bow, which even with its laminations would have struggled to cope with the extreme forces involved in firing such a device.